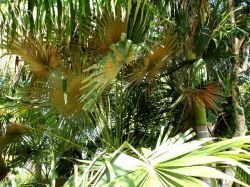 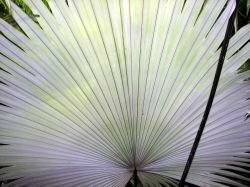 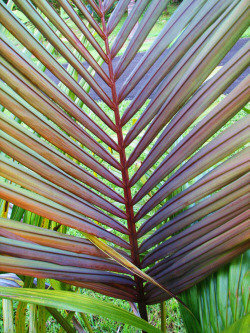 There are over 2500 species in the palm family (Arecaceae) and most are indeed some shade of green (though the hues and intensities vary tremendously). 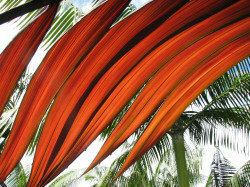 And most people think of green when palms are mentioned. 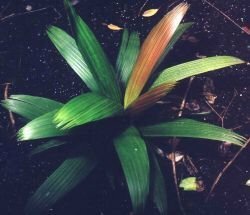 Those that know me or at least of my bent towards tropicals and succulents may think my relative disinterest in flowering plants means I am a 'green freak'. 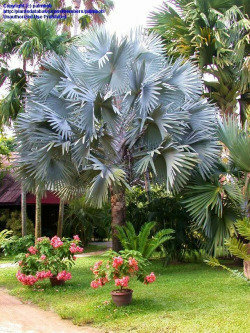 One does not normally associate most of the colors of the rainbow with palm trees, which, for the most part, do have very uninteresting or insignificant flowers. 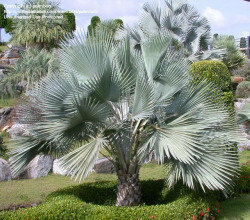 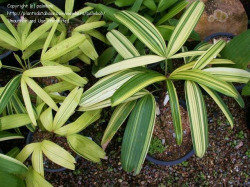 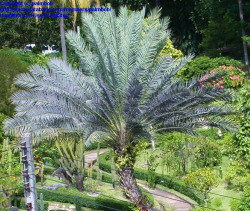 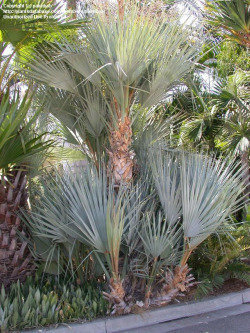 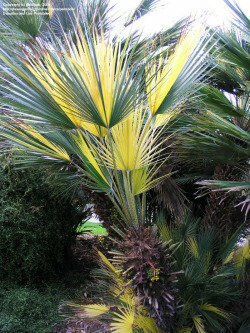 But some palms show an astounding variety of colors competing with the best of the ornamental foliage plants in cultivation. 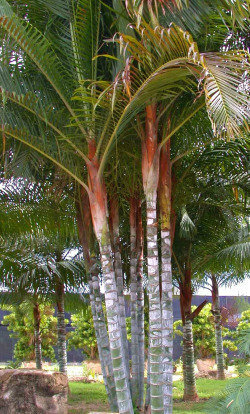 The colors of the foliage, fruits, trunks and even the roots of some palms are nearly unreal and vibrant in their displays. 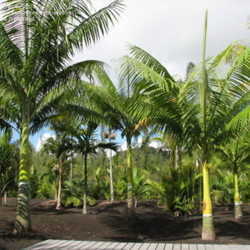 As you will see below, not all is green in the world of palms. 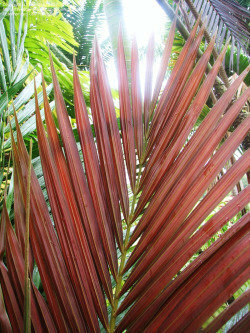 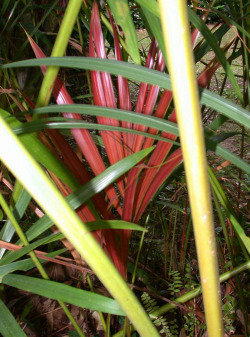 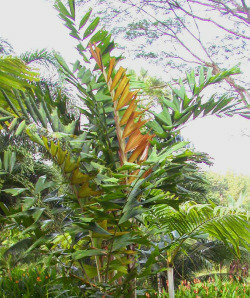 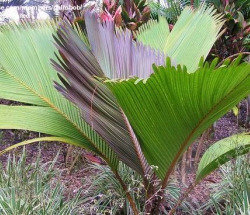 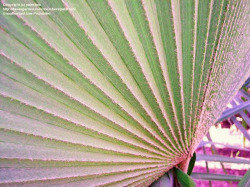 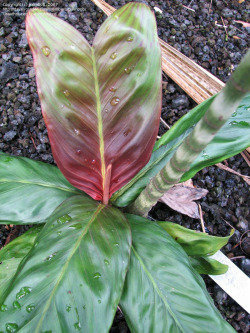 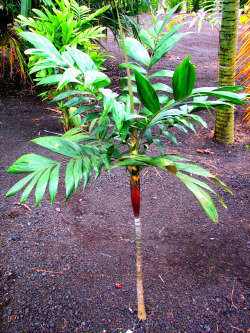 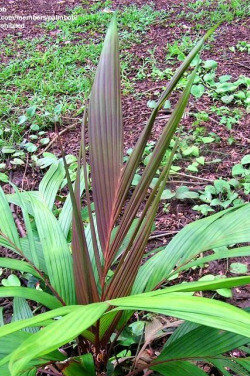 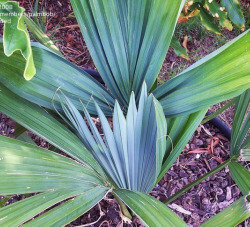 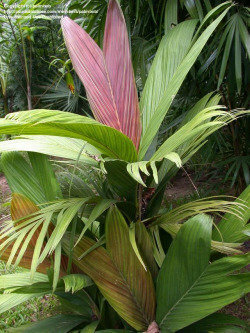 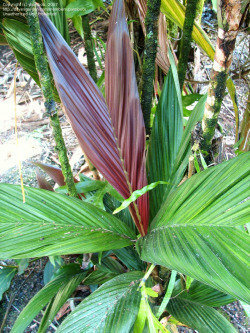 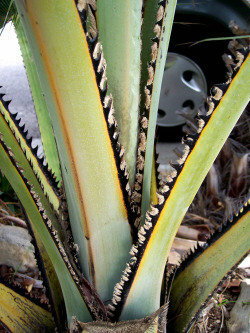 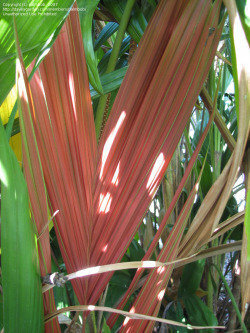 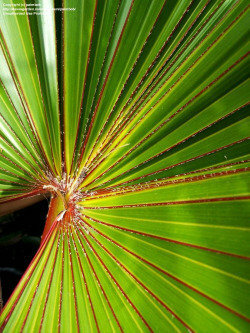 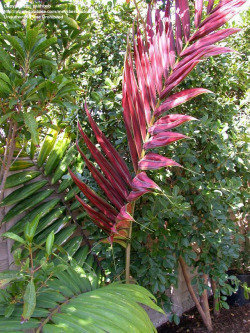 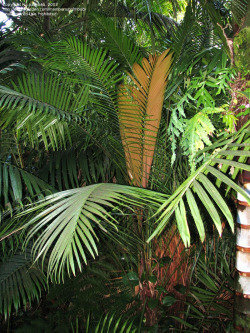 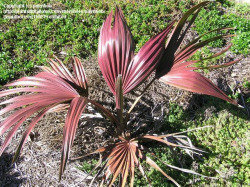 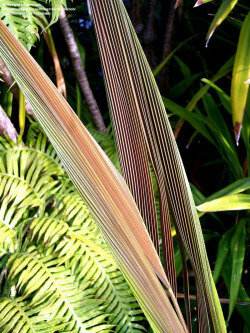 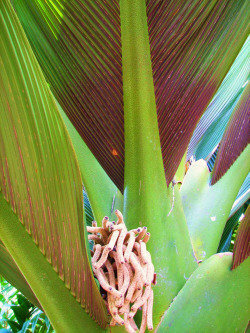 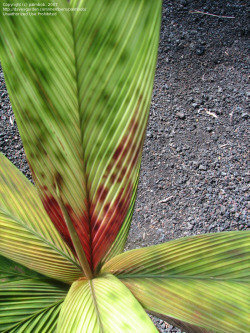 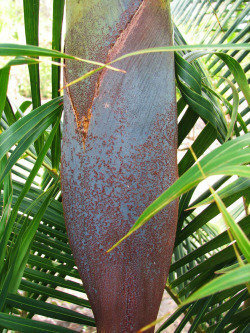 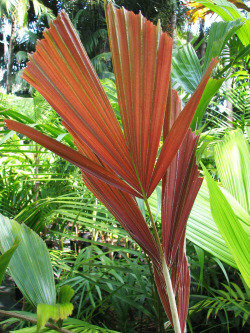 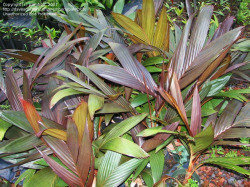 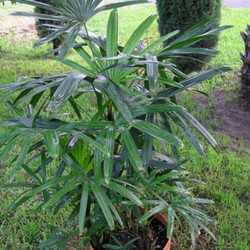 Like many other foliage plants, palms leaves are sometimes other colors than green. 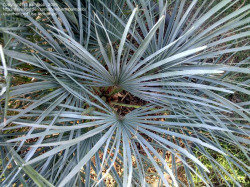 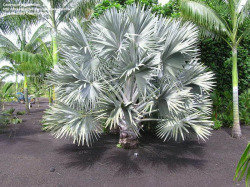 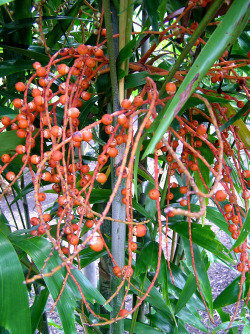 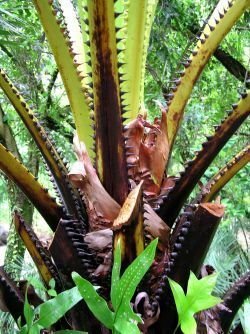 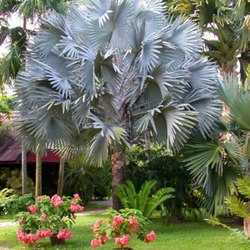 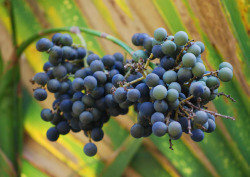 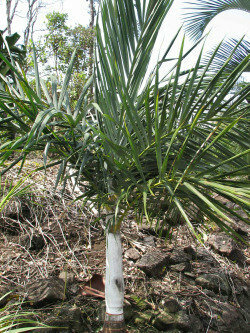 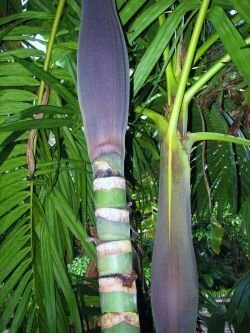 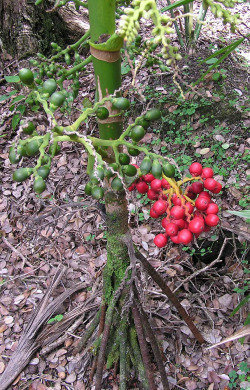 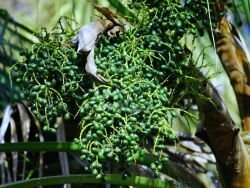 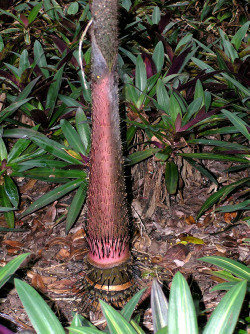 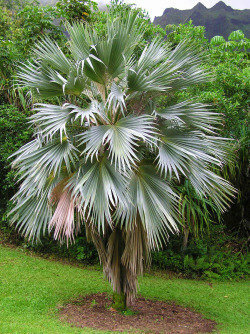 In a previous article I wrote on blue palms, some of these plants below were included. 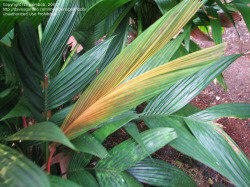 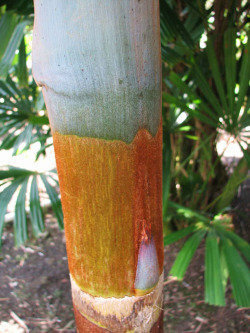 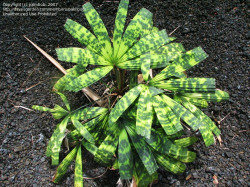 Some palms have variegation that makes thier leaves colorful. 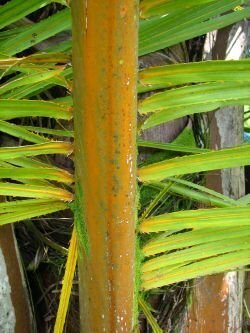 Variegation in the palm world (like with many other plants) can be a freak, random event, or occur predictably and consistently. 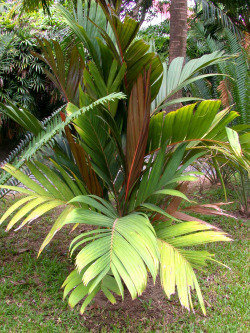 And some palms just have some nice non-green color on the undersides of their leaves. 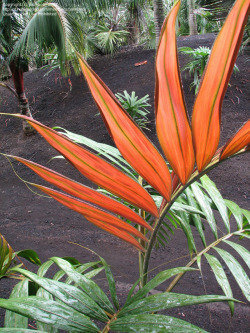 Brahea pimo has wonderfully fuzzy leaves with pinks and oranges on the undersides of the leaves (left); Kerriodoxa has nearly a pure white underside (middle) and Livistona fulva has coppery undersides (right). 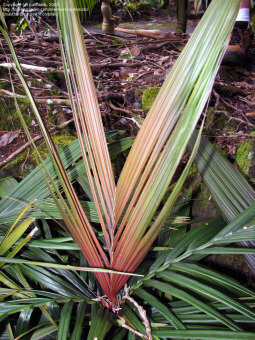 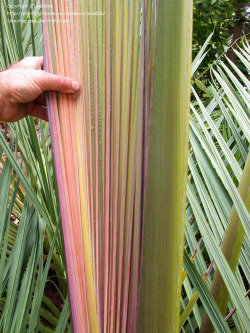 Though colorful leaves tend to be the most obvious parts of palms that are not all green, some palms also have nicely colored petioles (the leaves' 'stem'). 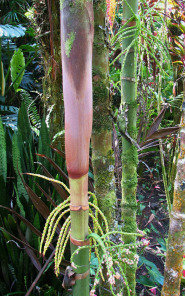 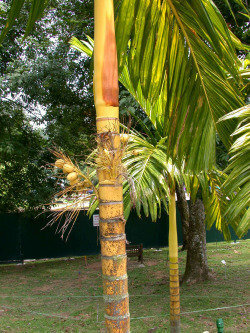 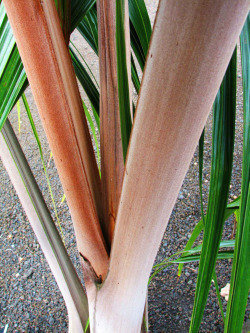 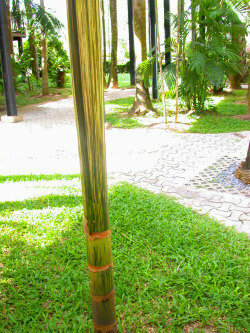 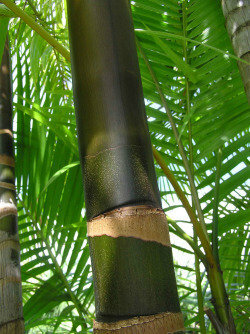 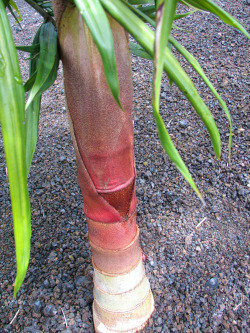 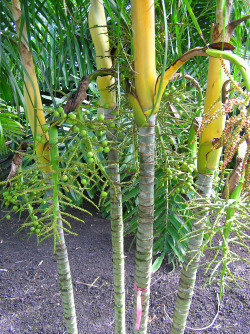 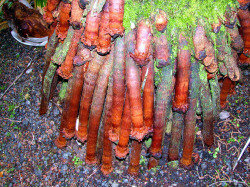 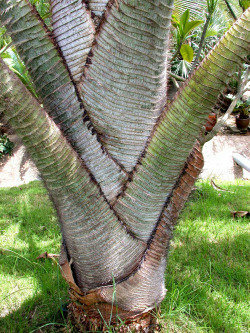 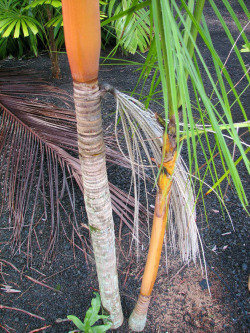 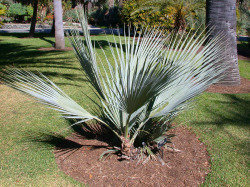 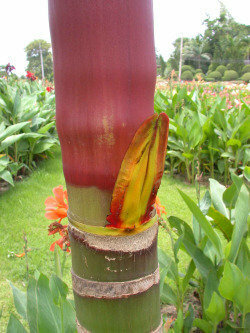 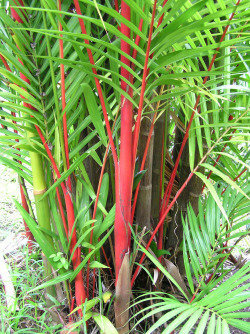 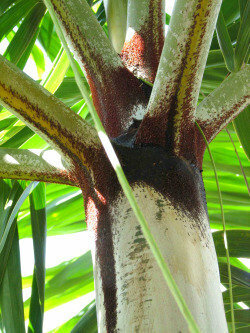 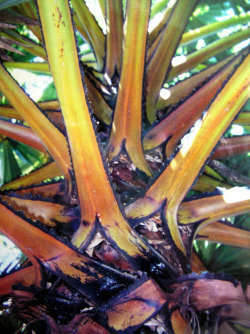 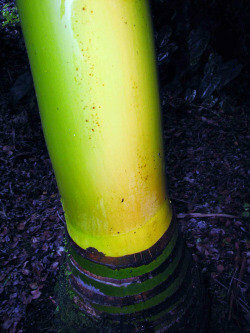 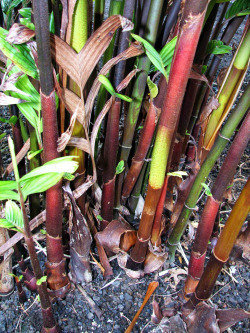 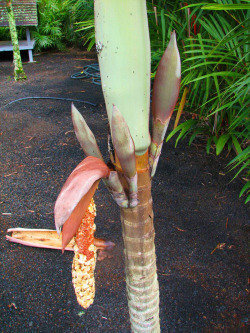 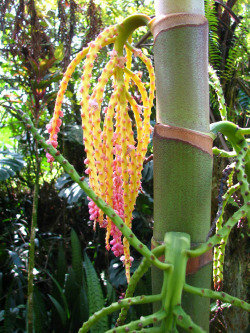 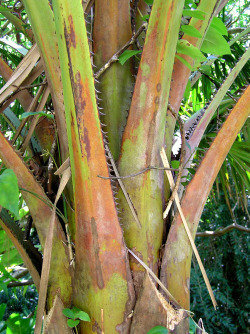 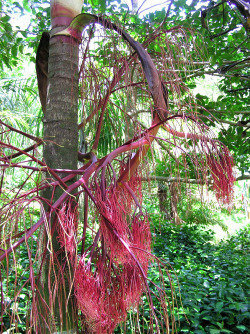 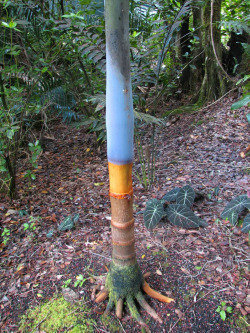 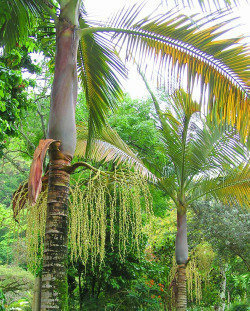 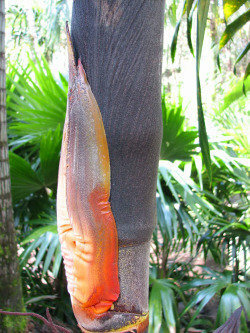 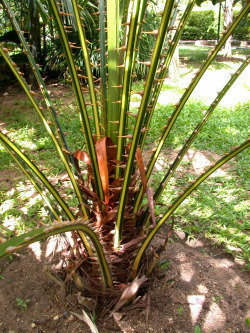 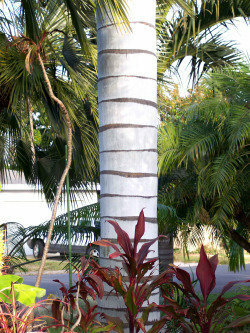 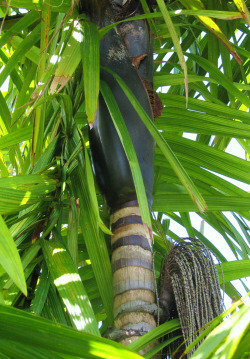 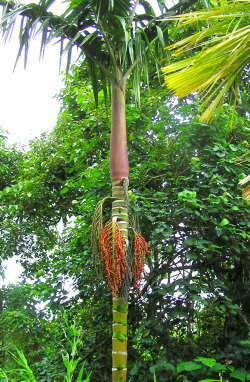 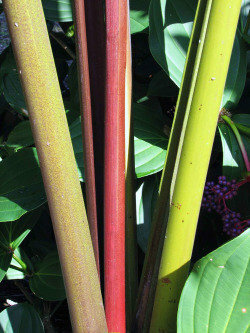 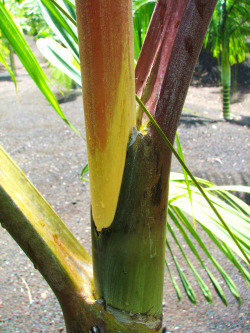 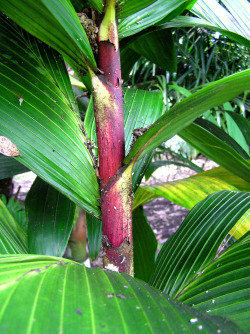 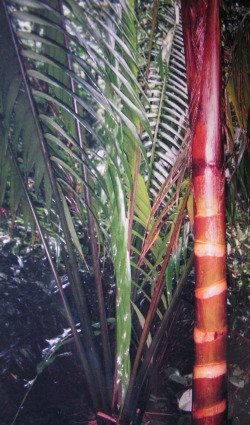 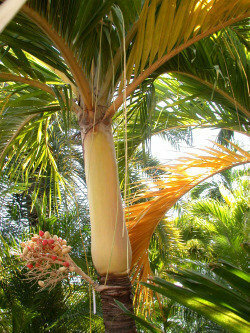 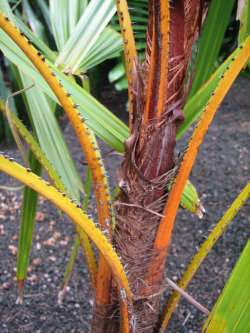 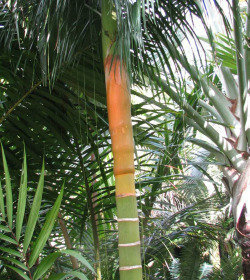 Some palms have brightly colored, or at least strikingly colored non-green stems or trunks. 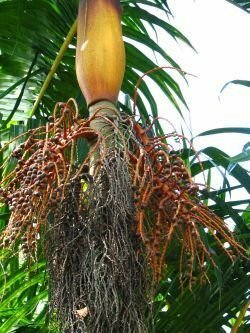 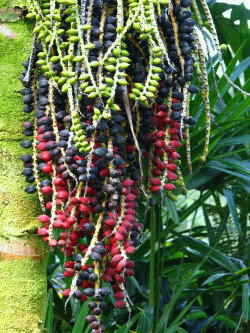 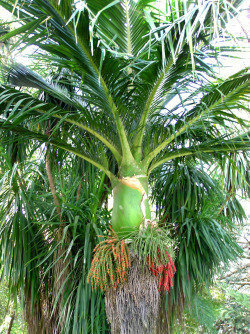 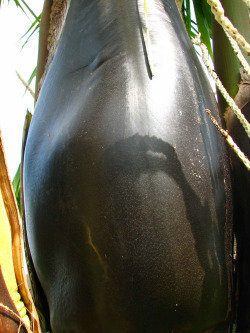 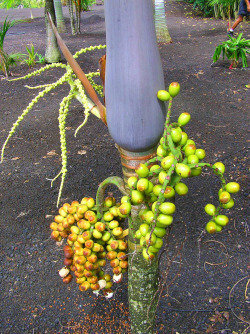 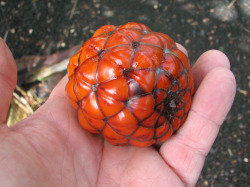 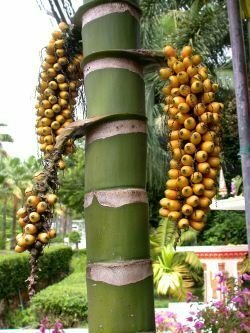 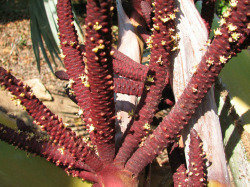 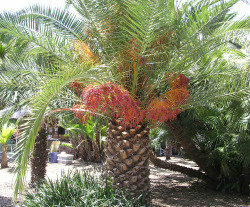 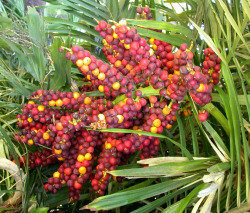 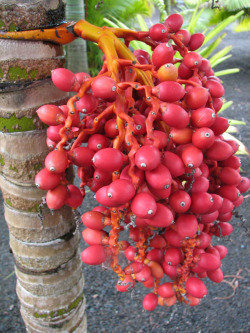 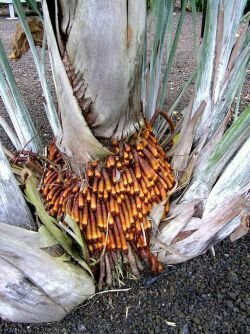 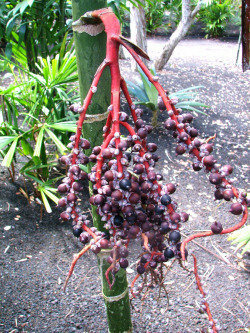 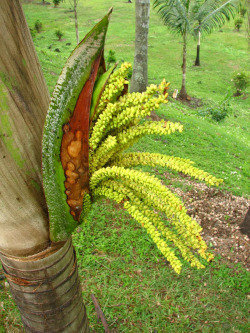 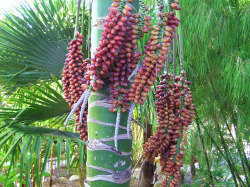 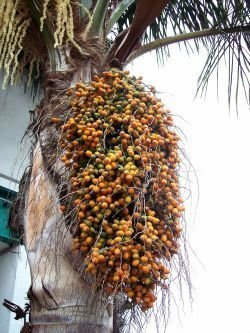 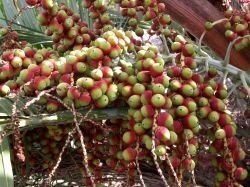 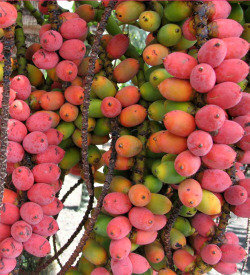 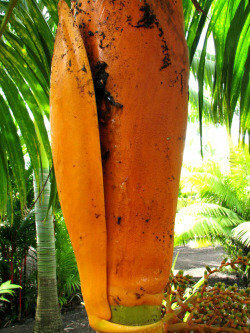 Palm Fruit is typically colorful, presumably to attract animals to consume it and spread about the seed. 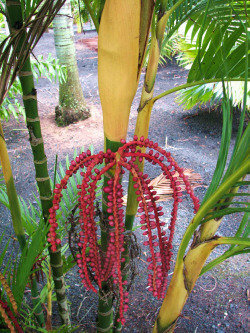 But some fruits really stand out.